Grease and line an 8 inch square tin with paper baking, ensuring two sides of the paper overhang. Add butter and chocolate to a heatproof bowl and microwave until melted, stirring every 30 seconds. Leave to cool slightly. Preheat the oven to 160 degrees (320 F). Next, add the sugar and vanilla to the chocolate mixture and stir. Add the eggs, one at a time and stir again. Then add flour and chocolate chips and stir until mixture is smooth. Pour the mixture into the prepared tin and very gently smooth over the top. 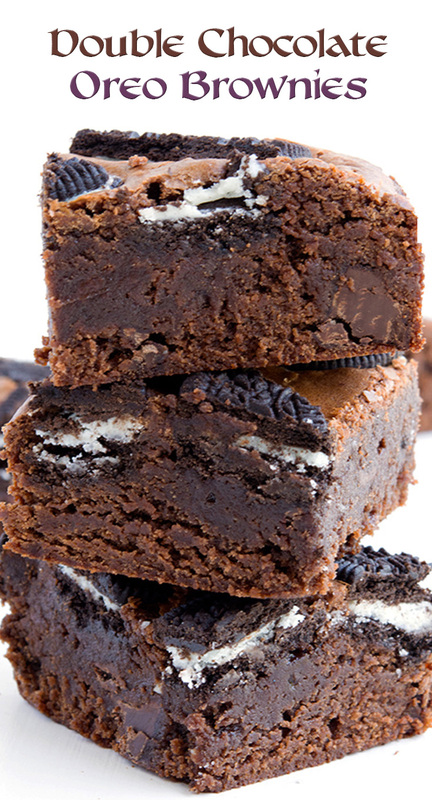 Place the broken Oreo pieces over the top of the brownie and press down slightly into the mixture.